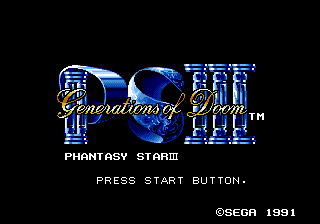 Phantasy Star III: Generations of Doom, known as Toki no Keishousha: Phantasy Star III (時の継承者 ファンタシースターIII) in Japan, is a 1990 RPG developed and published by Sega for the Sega Mega Drive. Like its predecessor, only Japanese, English, and Portuguese translations were produced officially. It is much unlike the other games as it does not take place in Algo star system. It also focuses on three generations of heroes. Thus, you can eventually control your children and grand children, depending on whom you marry at the end of the first two generations, bringing you to one of the four different endings. You will travel through seven lands, battling creatures and learning about the world that the game takes place in. This game was revolutionary for Sega, as it featured multiple endings and twisting gameplay paths. The graphic team was different to those behind Phantasy Star, Phantasy Star II and Phantasy Star IV. Phantasy Star III was included in Phantasy Star Collection for the Sega Saturn and Game Boy Advance, Sega Mega Drive Collection and Sega Mega Drive Ultimate Collection. Main article: Phantasy Star III: Generations of Doom/Magazine articles.